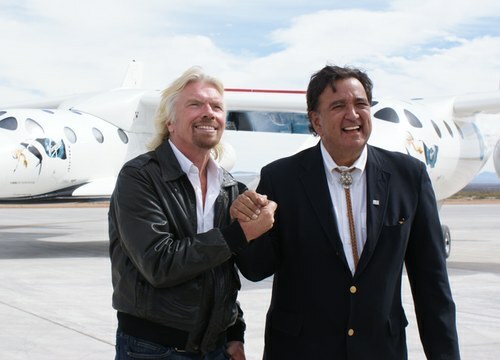 The Albuquerque Journal reported today that former New Mexico governor Bill Richardson, who helped push through development of that state’s new commercial spaceport, is going to be supporting the interests of another facility. Richardson will be hired by the Mojave Air and Space Port in California to help build support for an expanded version of an “informed consent” law that the California legislature passed, and Governor Jerry Brown signed into law, earlier this year. The bill is similar to legislation in several other states that indemnifies spaceflight operators from legal actions over accidents that injure or kill spaceflight participants (except in the case of negligence or intentional harm), provided the customers sign an “informed consent” waiver. The move has understandably raised some eyebrows in New Mexico, as noted in the Journal article. Officials with both Mojave and New Mexico’s Spaceport America say they are not direct competitors with each other: Mojave sees itself as more of an R&D facility while Spaceport America plans to be an operational spaceport with Virgin Galactic as its anchor customer. Witt mentioned that he also called upon a number of others in the industry for help in persuading Brown to sign the bill, from Paul Allen to Sir Richard Branson to Elon Musk. The lobbying effort worked: not only did Brown sign the bill last month, he did so in a signing ceremony timed to the flyover of the state capitol by the 747 carrying the shuttle Endeavour, bound for Los Angeles. In New Mexico, spaceport supporters, including Richarson’s successor, Susana Martinez, will make a second attempt next year to amend that state’s informed consent law to include suppliers. An effort earlier this year to amend the law died in the state legislature because of opposition from trial lawyers. Update 11/1: Parabolic Arc reports that, contrary to the Albuquerque Journal article, the Mojave Air and Space Port has no plans to hire Richardson. Witt did confirm that he hired Richardson in the summer to support efforts to get the original bill passed, paying the former governor $10,000. There are no plans, though, Witt told the airport’s board of directors, to hire Richardson again. The goal isn’t just to expand the protection to subcontractors, though that’s very important. It’s also important to remove the adjective “inherent” from risks. The California trial lawyers will fight this with gusto. This is quaint. But ultimately an exercise in going in circles, no place fast. A decade from now they’ll be skimming the skies having ceilinged out the market and looking for a bailout. Space exploitation is not space exploration. Your value of hardware over the people who ride it is well documented on this forum. It is far more likely that once the public are comfortable with suborbital commercial planes, over the next decade, the military will also have them and it will evolve to point to point transportation. After his betrayal of Bill and Hillary 2008, Richardson is reviled by both democrats and Republicans. I can’t think of a person less likely to win a Presidential nomination, unless it is Colin Powell. “informed consent”…To be kind to both Richardson and Branson I think that this is mostly crap…and more importantly while my Father (Gayle E. Oler) the attorney in the family, the attorney whose specialties were anti trust and “malpractice” suits would tell you that this is …well he would use a kinder word. But while Dad is in heaven now, his comments on bills like this are easy to find on the record. The circle that “informed consent” can cover in terms of lawsuit relief is very very small. For instance The folks killed by NASA in Challenger and Columbia could have signed twenty informed consent documents made by 1000 dollar an hour lawyers (n these cases Dad billed at 1500) …and that would not have stopped their heirs from seeking and getting a judgement against the operators of the shuttle had the shuttle been operated by a private concern. Dad was a solid “Mitt Romney” Republican but there is not a moment when someone talked about “litigation relief” (and that included the twit who is Gov of Texas) that he did not break into a chuckle. Lets try another way here. you cite an example “you” think that such a bill would protect from…then we can talk. Cogan airlines tried to run under “informed consent” in their defense of the Buffalo crash. The lead law suit in that case was one of Dad’s last big efforts before his body simply could no longer (as he put it) “take his mind to the courthouse”. we will see…but I predict you are wrong, in face I would wager 10000 of Romney’s dollars against you (grin). Although “informed consent” provides limited protection, limits on liability can make it unprofitable for an attorney to sue. this is of course the ultimate goal of all “businessmen” is to have limits on liability so low that well no one really can sue at all and hence the liability aspect of engineering goes out the window. Lets say for instance that colgan air was only liable for oh say 50,000 per person that they have die on their airplanes…well as Donald Trump would say “it becomes a business decision” devoid of any real cost on their part to try and run a safe product. The first case I recall my Dad taking on product liability was when he defended Beechcraft from being sued by the widow of a person who had landed with the gear up and in the process managed to kill himself. Beech asked my Dad (I have a story in Flying magazine about this so nothing privileged here) what a settlement should be and my dad wrote them a one word letter “DEFEND”. If NASA knew that it as an organization (or the people who worked for it) that they were personally liable for goofy decision, what do you think Jay Green would have been saying with Columbia or Linda Ham with Challenger (of sorry mixed the orbiters up the disasters are so similar). I know of one Chief of Staff of a Marine division in Iraq who after reports of troops being electrocuted in the showers came out informed the person in charge of the building of the showers that they or someone in their company would take the first shower in every damn space they built…or not eat take ones pick. The comment from RX A3010 looks like spam to me. Though I haven’t followed the YouTube link attached to the name, the fact that it is a YouTube link is very suspicious and I won’t take the bait by clicking it.